After yesterday's pastry-fest ready for the sausage rolls, I ended up with a fair bit left over. Some I froze, but I decided to keep a small portion back to make something else for the picnic. We're on a long journey today - eight hours of solid driving, provided there are no traffic jams and excluding stops - and so I needed to be prepared. 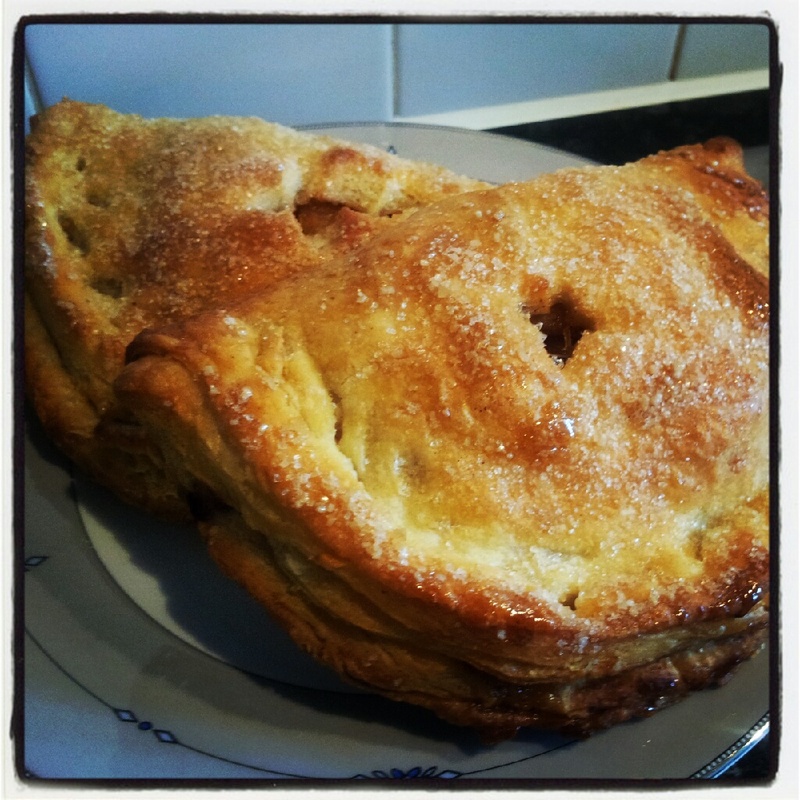 Having a bagful of apples that also needed either eating or adding to the picnic, I saw an opportunity to make Dan's Apple Turnovers - a recipe that he recommends alongside his All Butter Puff recipe. Earlier this week, the husband went out to buy wine and I asked him to bring me back something nice. He came back with Tesco's Apple Turnovers. They were stale and had no taste. What a waste of calories! So this seemed like a good time to show the husband how an apple turnover should taste. The apple filling tastes amazing. I used three apples-worth to make two turnovers (I like them packed with fruit, not air) and had a bit to spare. The butter, sugar, lemon, vanilla and cinnamon combination is fantastic with Pink Lady apples. And they keep their shape well without turning into mush like if you use cooking apple. I have to blog really quickly as the husband is downstairs, huffing and puffing about how to fit everything into the car and if he knew I was writing this, I wouldn't be very popular! And if he ever asks me to buy shop-bought apple turnovers again, I will hand in my notice as his wife. Seriously, if you have the time to try the puff recipe, you need to make these. They really are a treat (I've always hated the apple-pie-filling-stuffed-sugar-topped-cardboard that you get from the supermarket) and it's worth the effort. Also a great way to use up leftover pastry - make mini ones from pastry scraps. Right, got to fly before the husband purposely leaves behind my baking tins!